Halloween costumes are a big business. According to the National Retail Foundation, the amount spent on Halloween costumes this year is expected to reach $3.1 billion! As you can see, Halloween is not just for kids! What are you or the kids in your life going to be for Halloween? Let me know! Have a happy, safe, and fun Halloween. But I was curious what non-candy items other people may be giving out for this holiday. According to bigcountryhomepage.com, some people have been known to hand out toothbrushes and floss(!! ), and informational pamphlets. Yeah, if I were a kid, I’d definitely be skipping those houses. Other non-candy treat alternatives include stickers, temporary tattoos, pencils, mini note pads, glow necklaces, vampire teeth, and bookmarks. Those sound a lot more fun than dental floss! What are you planning to hand out for Halloween? Take our survey below! Oh, and don’t forget to scan everything you purchase for Halloween. We really want to know about what candy and other Halloween-related items you purchase for this holiday. 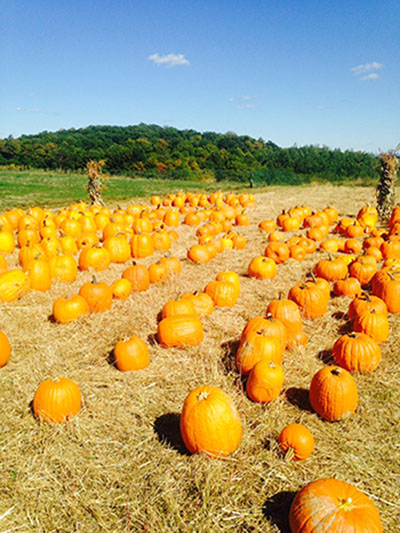 Pumpkin Picking, Corn Mazes, And Halloween Decorating: What A Week! So this week we went to a local farm and did some pumpkin picking. The kids really enjoyed it! While we were at the farm, we watched a pumpkin carving demonstration and got some great ideas for how to carve our own pumpkins. My husband and I really enjoyed the corn maze they had at the farm. It was quite a challenge getting through it! Front Door Flies – Attach fake plastic flies or other creepy insects around your front door handle. Glowing Eyes – Cut the eye shapes out of the side of the cardboard tube, insert glow sticks into the tube, and duct tape up the ends. “Hand”y Hallway – Find some hand props and mount them to your hallway walls for a spooky walk down the hall. Let me know about any great corn mazes you’ve seen, or how you’re decorating your house. Please note: On behalf of all of us at the National Consumer Panel, we hope that everyone in Hurricane Matthew’s path has taken precautions so that they’re safe from the storm. Our thoughts are with you. Then, if that wasn’t enough, we ate, and ate, and ate some more! One of the other great things about fall festivals is all the great food out there, such as apple pies, candied and caramel apples, and jams. It was a real treat! Next week we’re going pumpkin picking and then we’ll finish decorating the house. Also, I want to get to a few Oktoberfests in our area. No doubt my husband and I will indulge with some adult beverages! Since it seems that almost every city and town has its own fall festival, I wondered what other festivals were going on in other parts of the country. Here are just a few well-known festivals, according to CountryLiving.com. I’m sure they are plenty of festivals in your area of the country. Let me know which ones are your favorites!